← Will Eating Nuts Make Me Gain Weight? Could More Fruits and Vegetables Make Me Happier? Eating up to eight servings of fruit and vegetables a day could make you feel happier, new research suggests. Not being happy is generally caused by the way you feel. Generally, being depressed will prevent you from being happy. So, how do you get depressed? I only see two causes that can both be caused by the food you eat. The other reason for being depressed is not being happy with yourself. If you weigh too much it’s hard to keep up with your work, activities, etc. Your clothes never look right. You can’t wear the trendy clothes others wear. People stare, some people avoid you. You have constant problems like body odor, gas, indigestion and bloating. Experts have long recommended a diet with lots of fruits and vegetables to help guard against cancer and heart disease. But, researchers say, it’s hard to persuade people to eat more fruits and vegetables today when the benefits aren’t seen for years or even decades. However, improvements to your mood may be seen within 2 years, they say. They found that about 85% of participants had fewer than three daily servings of fruit, while 60% ate fewer than three daily servings of vegetables. Only a very small percentage of people (1.83%) ate, on average, more than five servings of fruit. Only 7.75% ate more than five servings of vegetables. The study found that improvements in happiness were seen for each extra daily portion of fruit and vegetables, up to eight portions a day. The researchers conclude that people who go from eating almost no fruit and veggies to eight servings every day would have an increase in life satisfaction equivalent to moving from unemployment to employment. That improvement would be seen within 24 months, they claim. Most people don’t feel the effects of being overweight until they’re over 50 and by that time they lose the ambition and motivation to do anything about it, so they take the pills and try and do what the doctor recommends and they continue on doing the best they can until they can’t live alone any longer. Do something about improving your life before you end up just existing. If you really want to lose your body fat than look for my Ebook at the websites listed below. The book only costs $1.99. You’ll get information on Healthy eating, exercise, and diet. 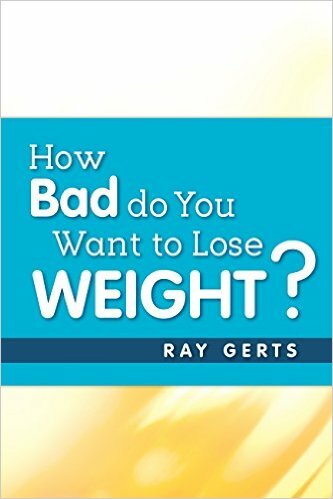 “How Bad Do You Want To Lose Weight?”, is available at all the online bookstores selling for $1.99. Go to any of the websites and search the title to find my Ebook. This book gives you all you need to lose weight without spending money on gym memberships, diet plans or meal plans. Look for my book. at Amazon.com, B&N.com, Ibooks, Kobo.com, Scribd.com, or Gardner Books in the U.K. This entry was posted in being healthy, diet, eating healthy, health and fitness, losing weight. Bookmark the permalink.